Angel's Landing in Zion National Park is one this park's most famous and celebrated hikes, leading 1450 feet up from the valley floor to a sandstone spire standing high above the North Fork of the Virgin River in the middle of the Big Bend. It is also rightly considered to be one of Zion's most difficult day hikes. Zion National Park's first superintendent Walter Ruesch was the architect of the West Rim Trail, which can take hikers from the Zion Visitor's Center all the way up to Lava Point; Angels Landing is just a side trip on this trail, but what a side trip! And Walter left his legacy carved into the side of Refrigerator Canyon. While this trip can be done as a side excursion from the West Rim Trail, most people do it as a day hike starting from The Grotto trailhead, which is where this description begins. After leaving the road, the trail immediately crosses a foot bridge over the North Fork of the Virgin River. Once on the west bank of the river, the trail heads north. At first the trail parallels the river, slowly gaining altitude, but after about a quarter of a mile after the crossing the river, the trail begins to rise more steeply in a series of switchbacks. In the gap below the hanging mouth of Refrigerator Canyon several switchbacks carved into the sandstone are visible. The trail continues to climb; during the summer time, this section of the trail is baking hot due to full southern exposure. The trail switchbacks several more times before reaching these rock-hewn switchbacks which take you into Refrigerator Canyon. Refrigerator Canyon gets its name from the deep shade it is in throughout most of the day, causing the temperature to be much cooler than on the earlier portion of the trail. This is a good thing, because here is where the real work on the Angels Landing trail begins. On the northeastern wall of Refrigerator Canyon is the infamous section of trail known as Walter's Wiggles. Originally constructed by Walter Ruesch to allow access out of Refrigerator Canyon, Walter's Wiggles has become a trademark images of Zion National Park, seen on postcards and shirts. The switchbacks are numerous and steep - please take you time going up them. In winter and early spring ice is often present on them, so use caution. At the top of Walter's Wiggles, the trail backtracks south along the ridge leading towards Angel's Landing. Scout's Lookout is located along this ridge, and is a popular viewpoint and turn-around point for many hikers. 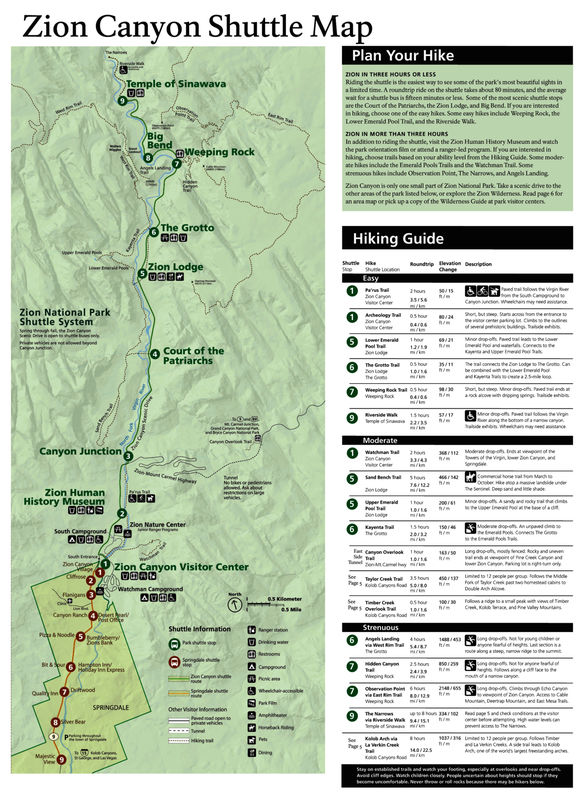 If you stop your hike here, your total round trip distance will be 3.9 miles, with an elevation gain of 1070 feet from the trailhead. The West Rim Trail branches off here, heading north and gaining altitude from Scout's Lookout. If you continue on to Angel's Landing, keep on the ridge heading southeast. Angel's Landing is the prominence at the point of the ridge, rising another 500 or so feet above the ridge. The trail narrows and continues climbing steeply towards the summit of Angel's Landing. While the views along the ridge are beautiful, looking down onto the North Fork of the Virgin River, it is when you get to the summit that the view becomes amazing. 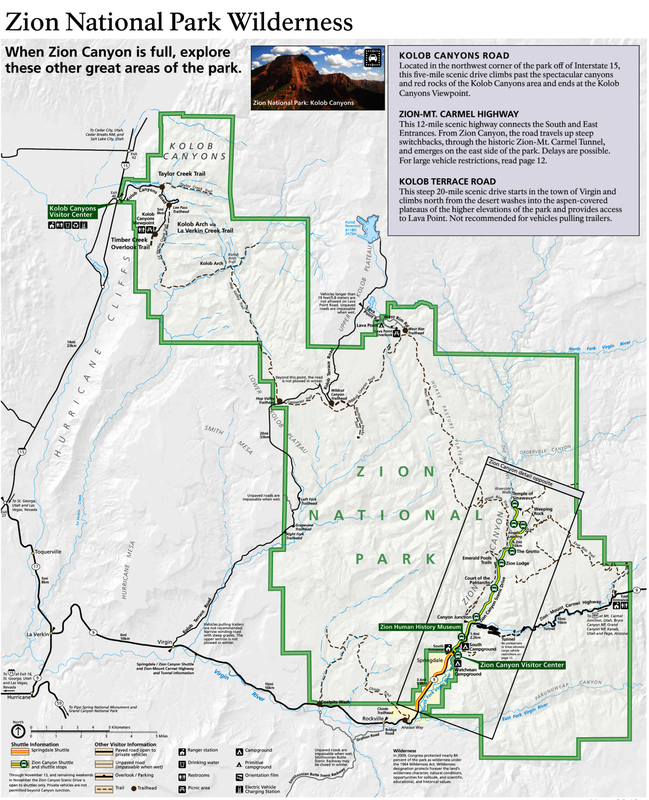 You can look north almost to the mouth of the narrows, southeast towards Hidden Canyon and the East Rim Trail, or south through the southern end of Zion almost to Springdale. The rock spur below and to the east of Angel's Landing is called the Organ, and beyond that is Weeping Rock. Once you have finished taking in the view, return the way that you came. This trail is rated as strenuous by the Park Service, rising almost 1500 feet in 2.5 miles, and there is no water along it's route anywhere, so be sure to bring your own. Zion National Park can be reached from Phoenix by way of Page, AZ. Take 89N to UT-9 @ Mt Carmel, UT. UT-9 will take you to the southern entrance to the park. From there, park at the Visitor's Center and take the shuttle to the Grotto TH. From Phoenix it's 394 mi - about 6 hours 45 mins.